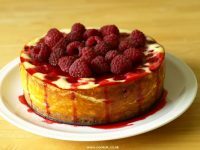 Cheesecake is one of the tastiest and most attractive of deserts. Our baked cheesecake recipe is easy to make and looks spectacular topped with raspberries. A great way to use up a glut of this fruit from your garden. : One 20cm (8in) round non-stick baking tin with a removable base or sides. A sieve. Turn the oven on, setting it to 180°C / 350°F / Gas Mark 4. Crush the biscuits in a food processor or place them in a bag and crush with a rolling pin. Separate one yolk from an egg. Lots has been written about cooking the mixture in a springform tin or one with a moveable base. We have tried both and the tin with the moveable base came out the winner every time - it preserved the edges of the cheesecake far better. Just make sure you grease it well. 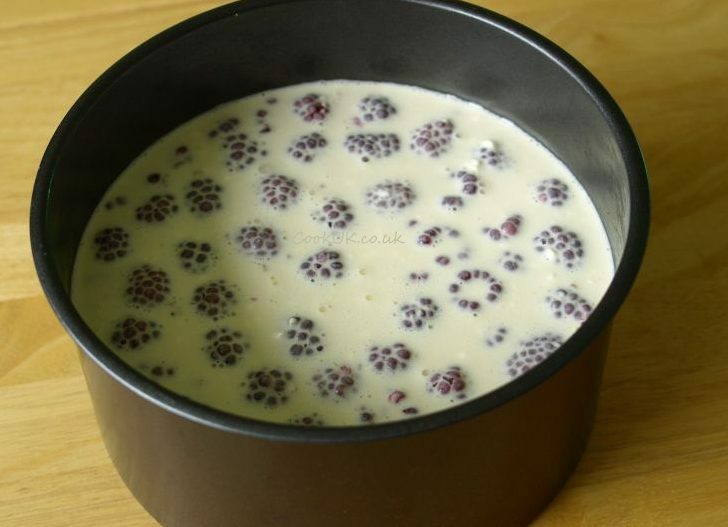 When the time comes to serve the cheesecake, place the base of the tin on a largish cup and gently push the edges of the tin down to remove it. Melt the butter on a medium heat until it is runny. Take it off the heat and mix in the crushed biscuits using a fork. 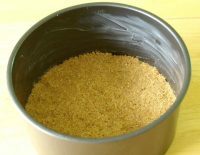 Place the mixture in the baking tin and firm it down using your hands. 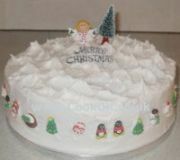 Make sure the base of the tin is covered to an even depth. Place the baking tin in the oven and bake for seven minutes. Remove it from the oven to cool. Place the cream cheese, eggs, egg yolk, soured cream, flour, caster sugar and vanilla essence in a large bowl. Mix them all together with a fork, do this vigorously for about 5 minutes. Add half of the raspberries and mix them in. Pour into the baking tin and bake for 40 minutes. 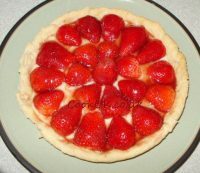 The cheesecake is properly cooked when the edges are firm and the centre is set but not yet firm. Place it to one side to cool. Place half of the remaining raspberries and icing sugar in a pan on a medium heat. Stir frequently with a fork until the raspberries turn almost to a liquid. Pour the mixture into a sieve with a bowl below. This will remove the pips. 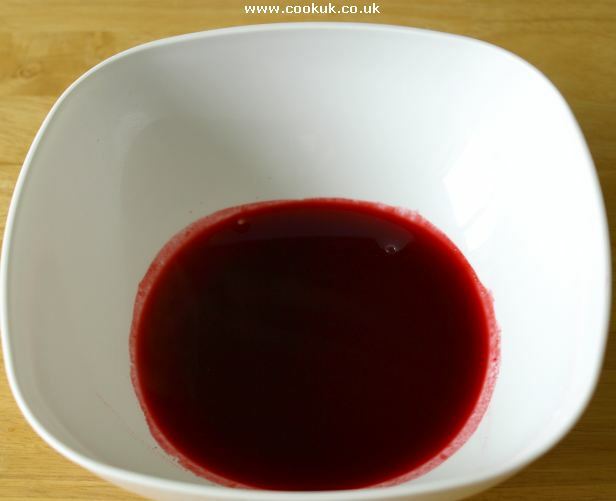 Press the mixture into the sieve with a spoon to remove all the juice. The cheese cake will probably still be slightly warm so place in the fridge (with the container of raspberry juice) for half an hour. 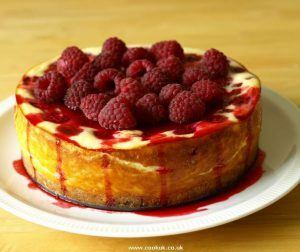 Pour the raspberry juice over the cheese cake then top it all off with the remaining raspberries. Place back in the fridge until ready to serve.